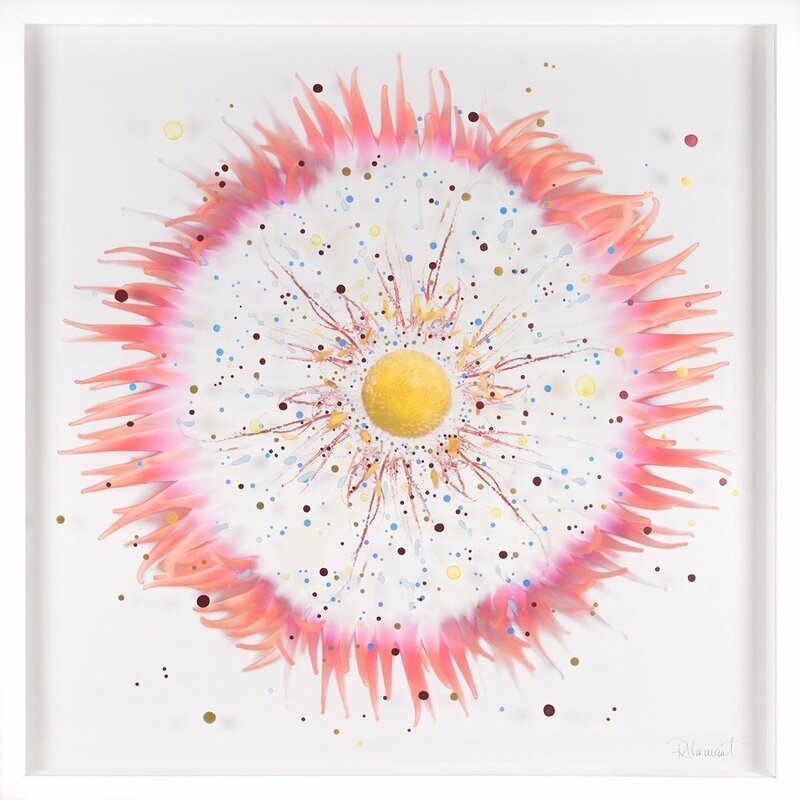 It’s hard not to smile at Mercartto artist Roz Hermant’s infectious optimism and energy. Learn more about this artist who creates fascinating, bold pieces that blend photography with hand-crafted shadow box frames that bring light into your space. I am a full-time fine art photographer and mixed media artist. I am a wanderer and a keen observer of big picture scenes down to tiny minute details. I am happiest spending time with family and friends and equally comfortable hermitting barefoot in my studio and backpacking through the Andes. What can I say, I was born on a cusp! As a kid, I was truly inspired by the photographs in my Dad’s National Geographic collection. I always thought that it would be amazing to travel and take photographs. I used to run around with my Dad’s old camera and take pictures of everything, even though there was no film in the camera. Years later, I eventually applied to Emily Carr University of Art and Design in Vancouver where I graduated from the photography program. When I’m not showing my work across Canada and the US, my time is spent in the studio. I think if you were to ask any artist why they create art, most would probably say that it is because we have to. More than that, it is how I can explain to you what my world is like, it is just being described without words. It is my best way to share with you my highs and lows, a favourite trip or location, what I see when I gaze at the ocean and what the weight of limbo feels like. What was best thing that happened that led to some sort of breakthrough that informed the way your work has developed? I was working on my grad project at the time and began photographing the human figure in empty desolate locations. I went to focus the lens one day while I was shooting, but realized the blurry image I saw in the viewfinder spoke to me in a far stronger way. It dawned on me instantly that the camera was not just a documentary tool, but a tool with a huge range that could create imagery in a way that ink or a brush could. That idea became a huge launching pad for me in terms of the work that I started to make at that point, and continue to make today. As for how I get better at what I do, the 10,000 hours that it takes to master my craft is absolutely true. I see, absorb, process and make, make, make. As an artist who has been at it for almost 15 years professionally now, I have learned to trust in my vision and my tool skillset that I can visualize a piece and see it through execution. Not that that works every time! I have a pile of duds and test pieces that I hang on to and reference that help me push through future work. What contributed to your breakthrough? While I was finishing my final year at Emily Carr, I had become engaged to my now husband who lived in Toronto at the time. I spent my life on planes going back and forth between Toronto and Vancouver, waiting for one chapter to end and the next to begin. I was living a life “In Between”, so when these lonely, haunting, blurred images began to emerge from the darkroom I really understood the power of storytelling with a camera. I think as a photographer, my job is really to observe. The image that results is almost secondary to how I combine what I see with my imagination. I am incredibly open to life and what it has to show me. It is this attitude that has encouraged me to push my art practice beyond photography in to mixed media, even though the camera is still my favourite brush in my toolbox. My art is important because it is my voice. It is the best way I have to put myself out there. So in that regard, all art is important because we should all have a voice as it contributes to the fabric of our communities. Also, it keeps me sane and happy to express myself visually and that transfers to my loved ones around me. To continue to expand on the great joys of life that I am lucky to enjoy now. Travel, love, art making and giving of myself to others in the ways that I am able. Have you fallen in love at first sight with art? Giacometti was the first artist that I fell in love with, truly at first sight. As for my perfect art match, I know the things I am typically drawn to like: the colours of water during sunset, texture, reflections and things that appear hidden until something magical reveals them, but sometimes you just don’t know what that perfect match is going to be until you see it! What message do you think every art buyer should hear? That my process and the amount of time it takes to make my work is really just the tip of the iceberg. There is so much of me that goes into each of my pieces that cannot be measured in minutes and dollars, but rather in emotion and experience. That artists who begin their careers in their 20’s will have to persevere into their 50’s to be noticed. I don’t give up very easily. My husband might say that I am stubborn and on certain days, he might be right. However, it is my determined attitude that pushes me through my art practice and keeps me focussed on creating a successful business and career doing what I love. Taking my art to Miami during Art Basel, which I am thrilled to say I will be doing this December !! Never count your money at the end of a show, count a year from the end of the show. You never know who you are going to meet and how much they might fall in love with your work. Large pieces are a big commitment for people to buy, sometimes it takes time.